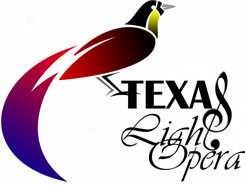 SAN ANTONIO, December 8, 2017 – Since their inception, Texas Light Opera (TLO) has endeavored to bring bigger and better productions to the South/Central Texas region. Their mission has been to provide a foundation for artists to perform in both classical operas and contemporary musicals, hoping to attract performers and audiences from San Antonio and the surrounding areas. It was this vision that inspired Executive Director Nicole Erwin to pursue a very new, and risky, idea: a small tour. Ms. Erwin has been the spearhead of TLO since the beginning and has longed to see it expand and grow into the various communities outside of San Antonio. This process began with a partnership between TLO and Hill Country Opera with their yearly New Year’s Eve event, featuring a performance of Die Fledermaus by Johann Straus. This production has always been performed in New Braunfels and continues to be a roaring success. This, however, proved to Erwin that TLO did not have to only reside in San Antonio but could expand outwards. “In San Antonio, to my knowledge anyway,” Erwin states, “there are only three professional companies that have ever taken their production on the road: The Magik Children’s Theatre, the Company Theatre, and now TLO.” The Magik Children’s Theatre has been featuring professional tours of its Theatre for Young Audiences for many years now, at both the regional and national level, with stunning success. The Company Theatre has also found commercial success with their regional endeavors, with productions being featured throughout Texas, including Dallas/Fort Worth and many others. Their productions are smaller, focusing more on the chemistry between actors, or even one-man productions of A Christmas Carol or The Complete History of Texas. The production team on this show is being led by Jason Kruger, a director and theatre teacher out of Austin. Jason has been a theatre educator for over 20 years and has also directed professionally in both DFW and Austin areas. Nicole Erwin will also be serving as Music Director and Vocal Coach. Ms. Erwin received Excellence in Direction of a Play at the 2017 Alamo Theater Arts Council (ATAC) Awards and has performed with the San Antonio Mastersinger as well as area stages including The Playhouse San Antonio and The Woodlawn Theatre. The cast includes Ginger Martel as Cathy. Ginger is a 20 year veteran of the stage, performing in theaters across the country, from Alabama to San Francisco. Ginger has lived and worked in San Antonio Theatre for the past 5 years, at venues such as The Playhouse San Antonio in productions such as Hairspray (Velma Von Tussle) and Urinetown. When she isn’t at rehearsal, Ginger works as the Managing Director of San Antonio chapter of Christian Youth Theatre in New Braunfels, and teaches private voice as well. Rounding out the cast is Joseph Urick, TLO Board Member and Artist-in-Residence with Aria Creative. Joseph is a classically trained actor who recently starred as Edgar in the Texas Premier of Edgar Allan Poe’s NEVERMORE, for which he received an Alamo Theatre Arts Council (ATAC) Award for Outstanding Performance by a Lead Actor in a Musical. Rounding out the production team is Chuck Drew, the Sound Designer who returns to TLO and Aria Creative after designing sound for NEVERMORE. The tour will begin in Seguin, at the Stephen and Mary Birch Texas Theatre. This 350 seat performance space has been named a historic venue for the city, and has seen stunning productions on its boards, including most recently, Moon Over Buffalo and Fences. The tour will then proceed to San Antonio, where Jonathan Pennington’s Roxie Theatre will host. Pennington is no stranger to partnering with TLO and Aria, as he hosted NEVERMORE. 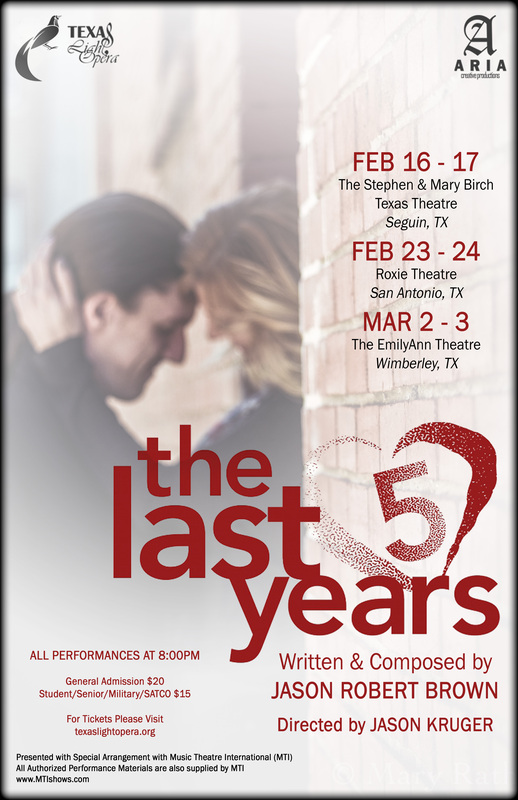 The last leg of the journey will take the production up to Wimberley, where The EmilyAnn Theatre & Gardens will host the show on their intimate black-box space. 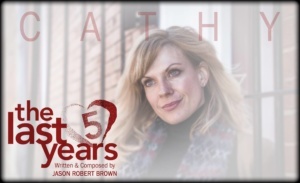 The show made its Off-Broadway debut in 2001, and earned Jason Robert Brown a Drama Desk Award for Best New Musical. It also won the hearts of its many fans, spawning a revival in 2013, as well as being made into a feature film in 2014, which starred Jeremy Jordan and Anna Kendrick. 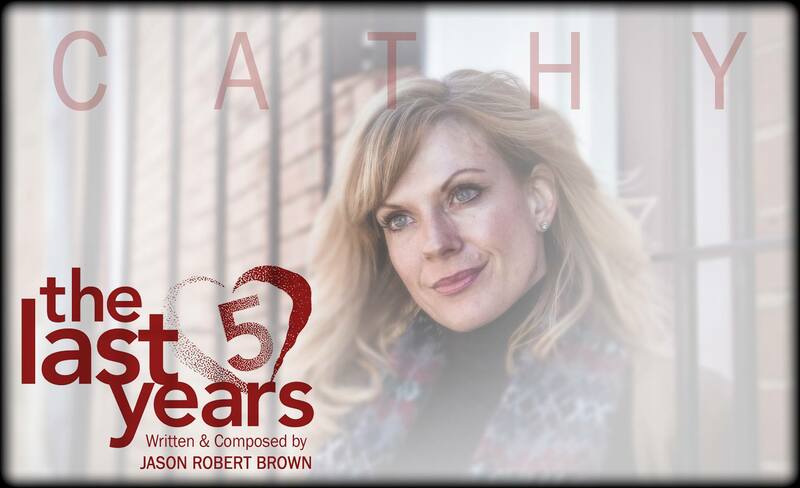 The show is an emotionally powerful and intimate musical about two New Yorkers who fall in and out of love over the course of five years. 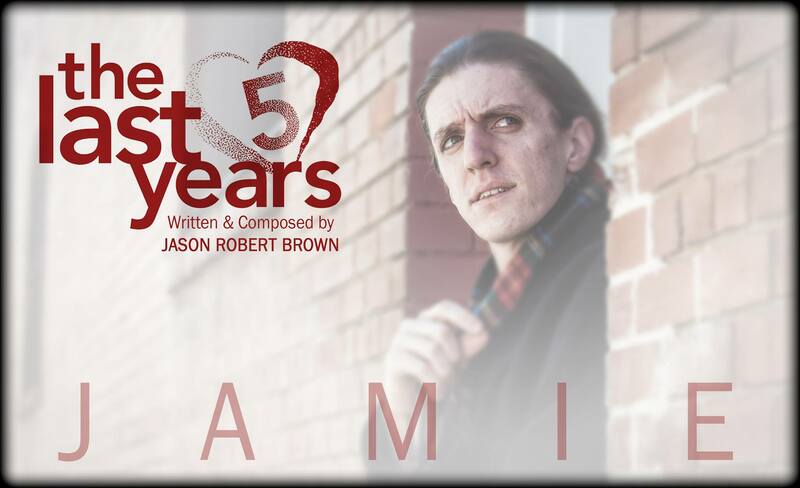 The show’s unconventional structure consists of Cathy telling her story backwards, while Jamie tells his story chronologically; the two characters are only on stage together once, at their wedding in the middle of the show. 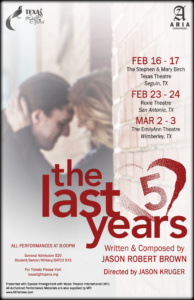 Texas Light Opera and Aria Creative Production’s Tour of The Last 5 Years can be seen this February and March in Seguin at the Texas Theatre, in San Antonio at the Roxie Theatre, and finally in Wimberley at The EmilyAnn Theatre. The production runs one hour and thirty minutes with no intermission. Tickets are available at the individual theatre’s respective Box Offices/Websites. Critics are invited to all performances. Run-time: One Hour, Thirty Minutes. No Intermission. Reviewers are invited on or after February 16. Photos Courtesy of Mary Rath.